Why are nutmeg plants so hard to find in Oz? Or am I just not looking hard enough? Yes i to have been looking, available from seed sources overseas but then there is the problem of transport and what sort of condition when they arrive would imagine also only short viability when picked fresh.Good look in your hunt if you find any let me know ,i have allspice already and grows well. Scott you should be able to grow it , very tropical tree and seems to be a very rare tree here in OZ . Also has a very short viability period supposedly . xclnt to hear that it is growing in cairns , please let me know when its getting close Mike .. bet Trina & Peter S would like some also . Lush looking Clove trees I will be planting soon , ones from Limberlost a bit runty and lost several and remaining one is struggling . Trikus they still might have to go to the salt water centenary lakes in greenslopes street and relieve the male tree of a branch for grafting onto a female sedling.I have a few seeds/seedlings to pass onto Peter and Trina. do they really (soursop) fruit in their second year from seed up there? Trikus, Clove tree(Syzygium aromaticum) is another on my wish list. Any ideas where I can source it? Forbidden Fruits have had them. Also try Isabell Shipards herb farm. 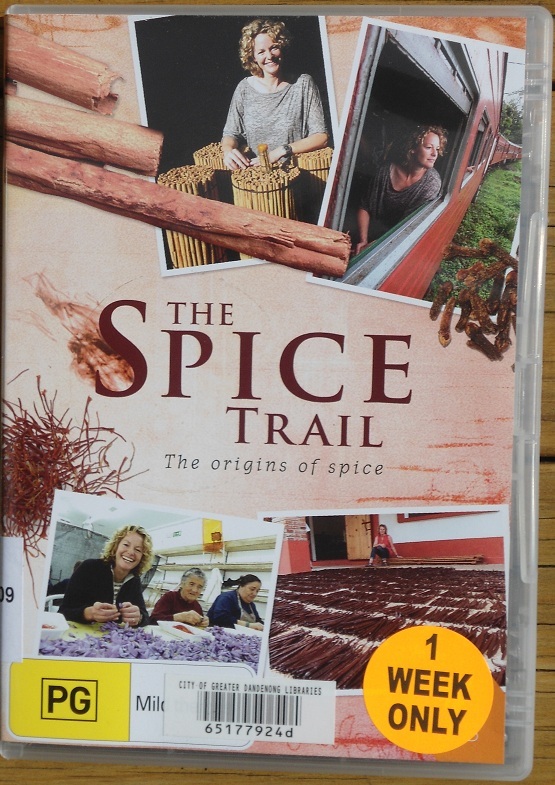 There is a really good movie on dvd all about some spices and the places they are grown commercially. It's called the Spice Trail and there are chapters on Nutmeg, Pepper, Cinnamon, Cloves, Vanilla and Saffron. It's worth watching if you are trying to grow any of these. 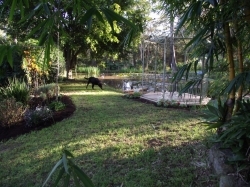 Hey Mike, I live in Tarzali, (outside Malanda) and have been searching for a nutmeg plant/graft whatever. Noticed your post and was wondering where you where at with that (and where is the magic tree in Little st-if your ok with sharing that info of course). Annette I know Tarzali well and have caught Lake Eacham Rainbows out of Dirran Creek.It may be a little cool up there at around 750m or more. Go to Greenslopes Street opposite the start of Little Street at the beginning of thew walk through to the Botanic Gardens.30m in on your left will be the nutmeg and there is a male branch grafted on I believe.The sign at the base will show its identity.It is an excellent cultivar that spent its early life at the kamerunga research station. 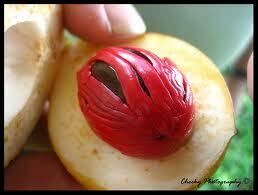 What is the best time of year to visit Cairns in the hopes of collecting some nutmeg seeds? I have passed through Cairns a few times, I don't need much excuse to go again. Has anyone heard if you can use native nutmeg in the same way? It is almost identical in seed/flesh to the spice. Thanks JE. The trees at Mt C crop heavily, so I was interested if they are useful. The second native species is better but still not the real deal. Well December isn't the time to go looking. Just visited the tree, very easy to find so thanks for the directions in this thread. It has small, single, yellow flowers dotted around, so I am guessing it is a female. Around the base are plenty of seedlings but judging by the leaf shape and the nearby trees I am guessing they are black sapote seedlings. Anything further on nutmeg seeds or seedlings anyone? 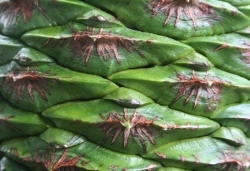 I got half a dozen Myristica insipida or globosa (no-one knows which they are) from the council nursery at Tully yesterday, to pot up and get actively growing over the next week or fortnight, then will try to graft material from the Cairns M. fragrans mother plant. I intend to try various bud and graft methods, and if it works for the females will do some males perhaps this time next year, or sooner if the grafts are obviously working. Meanwhile, if the females take, they might be fertilised by the local species for spice seed production. All not ideal, but perhaps worthwhile progress anyway. I will report! I collected a few pockets full of native Nutmeg along the beautiful Stoney Creek Walk near Kamerunga / Cairns. From memory, it was before Xmas time. Tried to grow some from a handful of seeds, but nothing came up. The fruit are smaller than the commercial spice you can buy, but I find, they have the same flavour and I used some instead of the commercial ones. Noting, that the Nutmeg tree at the Bot Gardens originated from the Kamerunga Research Station, there could be a link, like cross pollination or even some escapees, carried around by birds etc. Unfortunately I found many little grubs living in the seeds and eating holes through the seed. They came out and died, once I kept the Nutmegs in a closed jar, though not very inviting, to use them further. Also was able recently, to buy some Natives grown from cuttings at Yuruga Native Nursery near Walkamin. They have a website, you can look up.